The aim of this study was to develop and validate new dimension of mobile information behavior for Small Medium Enterprise (SME) workers in Malaysia. The items of this new developed scale were derived from previous study on information behavior. SME managers were participating in this study. A Kaiser-Meyer-Olkin (KMO) show that samples met the factor analysis criteria adequacy was 0.79 which indicates the appropriateness of the input in factor analysis. In addition Bartlett test was statistically significant with 0.000. The principal components method with varimax rotation was conducted to extract common factors. Item with factor loading >00.5 were selected to ensure a stable factor structure with adequate sample size. Factor extracted based on eigen-values greater than 1. Item with factor loading less than 0.5 and cross loading were removed. All items group into four dimensions are acquired based on the result of the rotated component matrix. Validity for the new dimension of mobile information behavior was found. Four dimensions were categorized as experiential need, social functional need, physical intellectual access, and social access. Result support validation of mobile information behavior dimensions for Malaysia SME workers. This research was funded by the Research Acculturation Grant- RAGS-600-RMI/RAGS/5/3 (103/2014) managed by the Research Management Institute (RMI), UiTM. 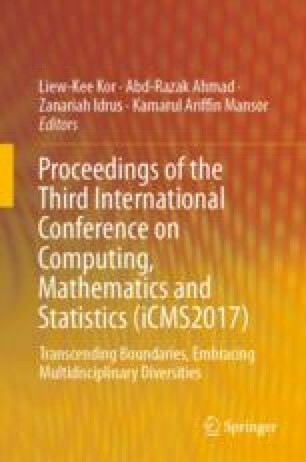 The authors wish to thank the Ministry of Education, Malaysia and Universiti Teknologi MARA (UiTM) Kedah, Malaysia for the support in this study.